The closeness that exists in a couple in the approach phase. Of course ultimately intended to eventually may lead to a formal relationship between each partner or better known as courtship. When both responding and give more attention to each other, it certainly will happen. They must affirm the closeness that exists between them to one of the couples will not assume that the closeness is very identical to exploit alone. However, do not be surprised when you find a man who hung with his girlfriend. The man could have had a different purpose the closeness as you notice. So that the man would be in a class of men who only spread false hope. 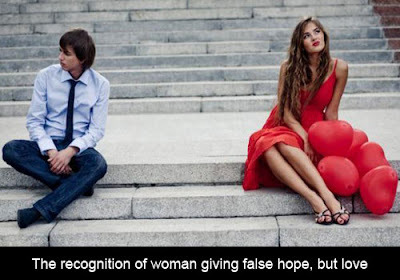 Perhaps you are more see the man who has the character of giving false hope to women. But actually, there were also women who give false hope. There are many women who establish a close relationship with a man and make such closeness is not meant as a love affair. But the woman has simply spread the charm to men by just giving false hope to the wishes and expectations of the man. There is a woman who later dared to tell the closeness with a man. Where the woman insists that she did not establish a definite relationship with the man. It thus would be so described that women were also entered into the group of women giving false hope. Thus, such a case can certainly provide an understanding that it is not just men who do and have such character. But there is also a class of women who owned the character. The woman establishes a the closeness with a man who until now she never confirmed the closeness to the man. Although she has a possessive nature to the man who is currently close to her. But actually, she just giving false hope to the man and choose to not going out with the man. The above story is the life story of a woman named Sakura (a pseudonym) is to establish a closeness with a man named Sasuke (a pseudonym). The beginning of their relationship for each of the parties that are in the same scope of work. In other words, they occupy the same office that is one of the private companies. Their relationship starts from a co-worker who came one office. But the friendship is well established so as to make them become close friends. The close friendship that later, become better established within 6 months. It makes their friendship became very tight and close. Six months like a friend continues to be very intense. After a long time the attention such as a person being an approach. Sasuke gives me attention, got home from work together, always go with him. If I want anything to be followed by him. He also often suddenly delivers food to my house. The closeness that exists between them makes Sasuke ventured to express his feelings. What he felt as well as a confirmation step performed by Sasuke to Sakura in defining their closeness. Sasuke conveys to Sakura that he wanted to make Sakura as a partner or girlfriend. However, when Sasuke revealed what was in his heart to the closeness with Sakura, he got the answer he did not expect. At that time, Sakura gives an answer by not accepting what the Sasuke's request, or it can be said that Sakura refused Sasuke. Although Sakura refused Sasuke, but she explained to Sasuke that she felt very comfortable and enjoyed the closeness that exists between them. Not only that, Sakura also confirmed that she did not want Sasuke away though she resists the Sasuke's desire. It thus illustrates that Sakura is not willing, if lost Sasuke who was her closest friend. Although Sasuke has been rejected by Sakura, Sasuke wants Sakura's wishes so he would not away from her even without bearing a status of "courtship". The closeness is increasingly well established between them made Sasuke becomes not desperate to always ask their closeness as a relationship like what. Although in the end Sakura still did not receive Sasuke's desire to emphasize the closeness that exists between them. Sakura felt more comfortable with the closeness that exists like this though without a clear and firm status. But one day, their closeness makes Sakura felt guilty about her relationship with Sasuke. Sakura thinks that she is a selfish woman and later she became concerned with the responses of people who classify her into class woman giving false hope. Feeling felt by Sakura was, in the end, makes her dare to take a decision to not communicate with Sasuke for two months. The action of Sakura who choose to stay away from Sasuke makes her became curious about the current Sasuke's life. Finally, Sakura knows that Sasuke has now established a the closeness with another woman. It makes Sakura became jealous and feel not accept this fact. She then took the decision to contact Sasuke and re-establish the closeness without a name. After I talk to him that actually I can not away from him. But since I feel guilty so I pulled away. He even said that he also enjoyed a relationship like this. He was also happy in his current position. I realize that I love him, but for the moment, I can not commit. 0 Response to "The recognition of woman giving false hope, but love"